Thank you for visiting our page. My name is Robin and I am Victoria's mother, advocate, and number one fan. Please let me take a moment to tell you about my daughter Victoria Faith McNabb. 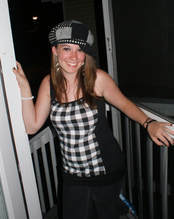 Victoria is a native of Buncombe County, Asheville North Carolina. 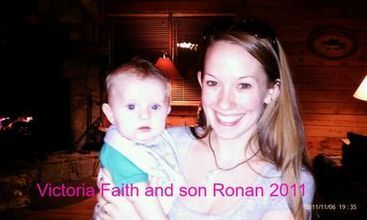 Born on January 22, 1994, Victoria is a 24 year old mother of Ronan who is now six years old. Victoria was a gifted pianist, artist, ballroom dancer, and spent most of her time with her son Ronan. On Friday, May 22, of 2015 (Memorial Day Weekend) Victoria Faith was walking to cross the street (yes, a pedestrian) to catch the bus. A driver that hit her traveling 45 mph, and the impact of the car caused a massive hematoma on the left side of her head. Then the car knocked her 53 feet in the air causing the second blow to Victoria's head, and as she landed the impact knocked out a front tooth and broke nearly every bone in her face. 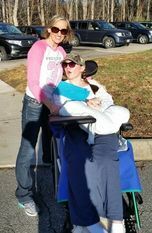 Victoria Faith now suffers from Severe Traumatic Brain Injury. Her brain had over 16 hemorrhages, and it sheared the gray and white matter. At the time of the trauma either on the road or in the ER, she experienced a mild stroke or a series of mini strokes. This has added to the complications that has severely affected the left side of her body. Victoria Faith was in a coma for 10 days, and was admitted to the neuro-trauma ICU for 21 days and the trauma unit for 9. Then leaving the hospital she went to Care Partners, a C.A.R.F. accredited facility. For the next 81 days Victoria received basic therapy for her condition. I was told that as long as she was progressing the therapy would continue. But because the progress was slow, I was told her only options were to go home or to a nursing home. 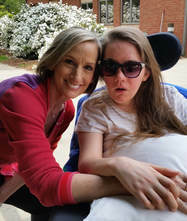 With only few exceptions, I have been by her side as much as possible, caring for me, doing therapy, feeding me a quality pureed meal and making sure my environment is healthy and happy. The Drivers insurance has not acknowledged any wrong doing. Therefore, did not pay anything for the accident. It is interesting, the fact that I was hit at a section of the highway that was in a ½ mile straight away. No rain all day, at about 6:55 p.m. on Memorial Day weekend. The police only did an accident report as if it was a “fender bender” and never pursued a full investigation. ​At this point, I can only move my right arm and leg reasonably well and am for the most part incapacitated. I cannot speak yet because my speech pathways are blocked. Since going to the nursing home I have received no therapy due to the facilities doctor refusing all requests for therapy. ​My neurologist, Dr. Jean-Ronel-Corbier, director of Brain Restoration Clinic, has me in an intensive treatment program that cost about $13,655 a year and includes some nutritional supplementation, many of the tests I need to have my condition evaluated as I progress, and access to many of the specialists that the nursing home has denied me. This is a priority and he comes highly recommended due to the severity of my condition. Along with the neurologists program, I need to receive hyperbaric oxygen therapy at a cost of $150 a session. It is recommended that I go to the chamber 3 to 4 times a week for the first four to six months of therapy. I also need intense neuro-plasticity treatment twice a day four times a week for a number of months at a cost of $400 a session. After a number of months of intense neuro-plasticity treatments, I will have to go less frequently but that will have to be evaluated as I improve.